Sambar (Cervus unicolor)Sambar are a very elusive quarry and a free-range trophy is an extremely rare and highly-valued prize. We have great free-range options with a success rate well over 80%. Appearance: Very sturdy, dark brown, some with a mane, big rounded ears white at the tips and deep pre-orbital glands. Antlers: 3 points per side with the second tine inside the main beam. Trophy size: Trophies range from 24-31 inches in length. History: Introduced to Australia and New Zealand in the 1860’s from Sri Lanka and India. 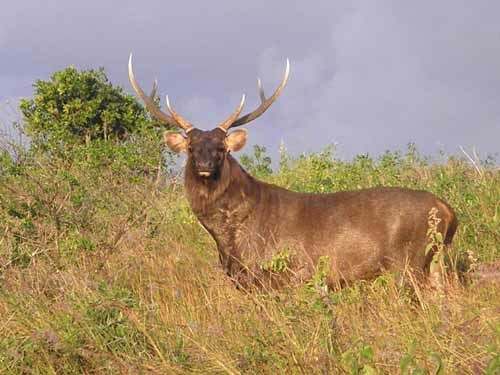 Hunting Sambar: Sambar are a large and extremely wary deer, and are considered one of the South Pacific’s most difficult and prestigious trophy animals. They like thick cover and are rarely seen far from cover in daylight. We try to catch them in the early morning as they head back to cover or sit in a good position late afternoon and let them feed out. Patience is essential.